I love ratatouille, the roasted vegetable dish that originated in France. My friend Angela made an incredible version when we visited her in Provence, and I’ve hoped to replicate it ever since. 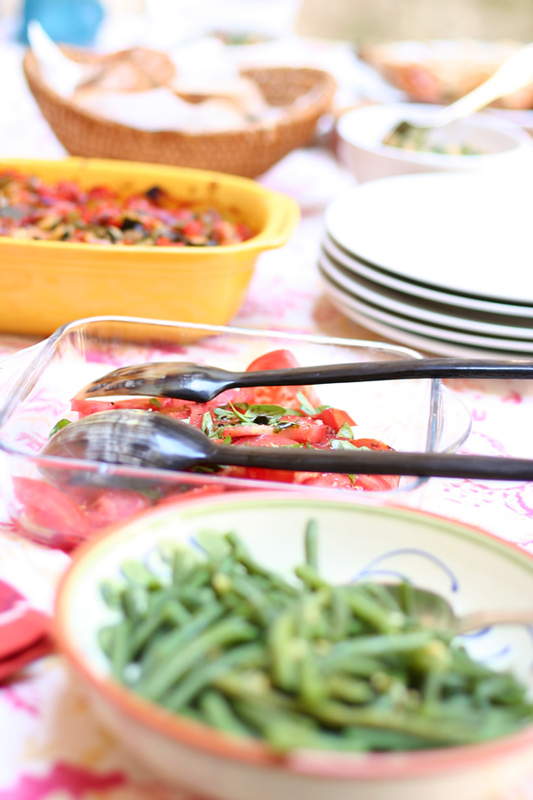 The key is the freshest vegetables and a lot of your best-quality extra-virgin olive oil. This dish takes a while to prepare, so it’s perfect for Sunday supper, when you can multi-task and let it cook thoroughly. Since I’m a big fan of one-dish dinners, I decided to add the ground beef option, and serve it over roasted spaghetti squash. 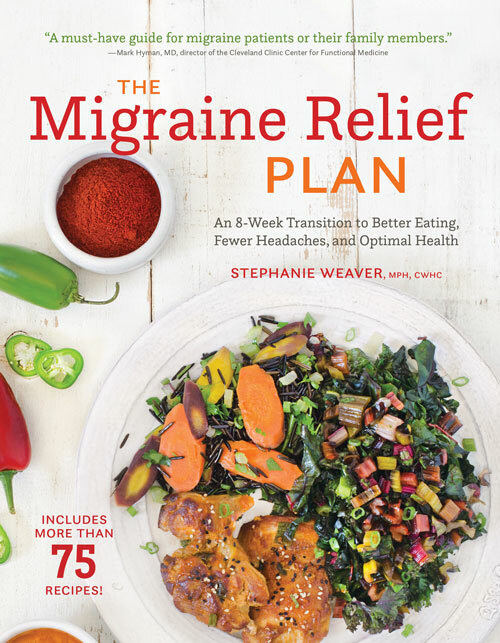 It makes a perfect paleo, grain-free, and migraine-friendly meal. This recipe makes a lot, so feel free to freeze half of the ratatouille, then thaw and cook with the freshly cooked beef. 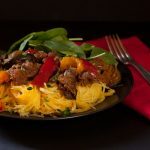 Hearty Provencal vegetable stew, to which I add ground beef and serve over roasted spaghetti squash for a complete dinner. Heat 1 tbsp olive oil in a large cast iron or nonstick pan over medium-high heat. Sauté the onions until they are soft. Transfer to a deep roasting pan or oven-safe baking dish. Sauté each of the other vegetables separately, adding more oil as needed, until each is golden. Transfer as you finish to the baking dish. Add the tomatoes, uncooked, and thyme, and season with a tiny amount of salt and a generous amount of black pepper. Drizzle with additional olive oil. Stir to combine. Bake at 350F/180C/gas mark 4 for about 40 minutes until soft and tender. Stir in a handful of torn basil leaves before serving. Wash one squash. Slice off each end, then slice lengthwise. Use a spoon (grapefruit spoons work great for this) to scrape out the seeds and stringy bits. Spray or oil the cut side of the squash, then place cut side down on a baking sheet lined with parchment paper or a silicone liner. Roast at 350F/180C/gas mark 4 for 35-45 minutes until fork tender. Let cool enough to handle. Use a fork to separate the flesh into spaghetti-like strands. Compost or toss the skin. Add grass-fed ground beef and garlic. Add a tiny amount of salt and a generous amount of black pepper. Sauté the beef until cooked through and no longer pink. Add the ratatouille to the beef and cook until all flavors are combined. 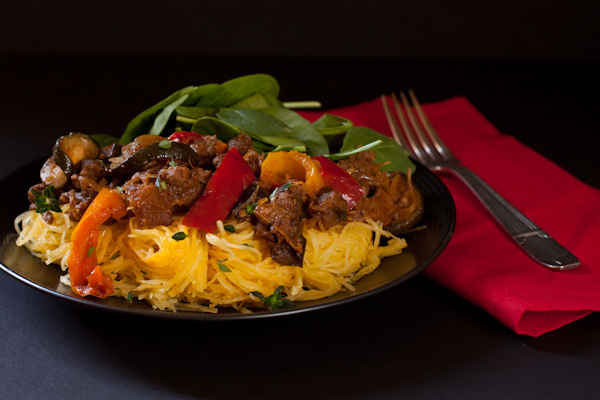 Serve over warm spaghetti squash strands and a side salad (shown). Garnish with fresh thyme. Looks wonderful – and your photo is fantastic! Thanks Liz, it’s such a hearty meal.